Trump travel ban: What did we learn from the ruling? Federal circuit courts usually toil in anonymity. They are a legal rest stop for landmark cases on the way to the Supreme Court. But this week it was different. All eyes were on three judges of the Ninth Circuit Court of Appeals, who, for a brief moment, had the fate of Donald Trump's immigration order in their hands. They were considering whether to sustain a temporary injunction preventing implementation of Mr Trump's sweeping travel ban on seven predominantly Muslim nations. On Thursday night they gave their ruling. Mr Trump's order stayed on ice. Here are three things we learned from the ruling - and two questions that remain unanswered. The Ninth Circuit was the Trump administration's best chance to get the president's immigration order up and running again quickly. The three judges could have re-instated the order and closed the borders as early as Thursday night. Instead, the order remains in limbo and it's likely to take time to resolve. The Supreme Court could hear an appeal, but the chances of more than four justices agreeing to reverse the Ninth Circuit ruling seem slim. Is Ruth Bader Ginsburg, Sonia Sotomayor, Stephen Breyer or Elena Kagan going to side with Mr Trump? Not likely. Is the US heading for a constitutional crisis? If this goes back down to the district court in Seattle, where it began, the gears of justice will grind even more slowly. A trial on the merits - which is slated to happen next, pending Supreme Court action - is a slow process. Briefs need to be filed. Evidence has to be submitted. Oral arguments will be scheduled. These things can take months or even years. That's a painful lesson Barack Obama learned in 2015, when a district court judge blocked implementation of some of his immigration reforms and the Supreme Court didn't hear the case for more than a year. This may seem obvious now, but on Thursday the president was fairly certain that his case was open-and-shut when he read what he viewed as the governing immigration statute to a gathering of law enforcement officers. "You can be a lawyer, or you don't have to be a lawyer; if you were a good student in high school or a bad student in high school, you can understand this," he said. "And it's really incredible to me that we have a court case that's going on so long." 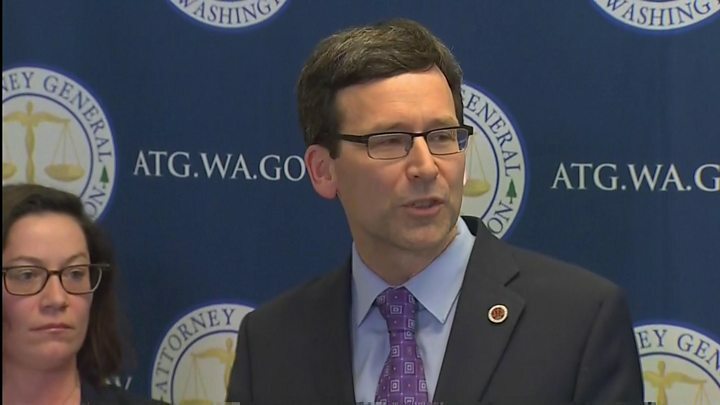 Media captionBob Ferguson: Travel ban was adopted with "little thought, little planning, little oversight"
Some conservatives, as well, wrote that the governing laws were clear that the president has broad powers when dealing with immigration issues. "For all except the most partisan, it is likely impossible to read the Washington state lawsuit... and not come away with the conclusion that the Trump order is on sound legal and constitutional ground." In the end, however, the three justices - two appointed by Democrats and one nominated by Republican George W Bush - saw things differently. While they acknowledged the president's authority on immigration matters, they said the statute Mr Trump cited was not the final word on the matter. "Although our jurisprudence has long counselled deference to the political branches on matters of immigration and national security, neither the Supreme Court nor our court has ever held that courts lack the authority to review executive action in those arenas for compliance with the Constitution," the judges wrote. In other words, federal immigration law may have been on Mr Trump's side, but the Constitution wasn't. At the heart of the Ninth Circuit's decision to uphold the injunction against Mr Trump's order was that it violated the constitutional due process rights of all persons in the US, regardless of their citizenship or immigration status. And time and time again the judges pointed to how the order was initially implemented as reason for keeping it on hold. They wrote that permanent residents and lawful visa holders were not given "constitutionally sufficient notice and an opportunity to respond". While they noted that the Trump administration had since interpreted the order as allowing all permanent residents into the US, they were unconvinced that this new interpretation would be uniformly followed or safe from reversal. They said that the travel ban caused considerable harm, including the separation of families, stranding of US residents abroad and prevention of students and employees from travelling to American universities. A more measured, orchestrated rollout of the immigration order may have avoided these complications, weakening the case against it. Mr Trump said on Wednesday that speed was necessary in implementing the ban because otherwise a "whole pile of bad people, perhaps with very evil intentions" would enter the country before border restrictions tightened. Here, however, haste may have killed his legal case. 1. 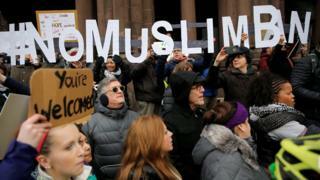 Is the immigration order anti-Muslim? Shortly after the Ninth Circuit issued its opinion, Nevada Democratic Senator Catherine Cortez Masto released a statement saying that the court "reaffirms that President Trump's hateful and divisive executive order amounts to religious discrimination against Muslims". While the decision was certainly a blow for the Trump administration, the judges were notably restrained in discussing the religious issue. "The states' claims raise serious allegations and present significant constitutional questions," the judges wrote. Then they said they wouldn't consider the question further, since they had already decided the case on due process grounds. They did offer one clue as to how they might eventually rule, however. The Trump administration had insisted that the order must be judged on its own, without taking into consideration past remarks made by Mr Trump and his supporters touting a "Muslim ban". The judges disagreed. "It is well established that evidence of purpose beyond the face of the challenged law may be considered in evaluating Establishment and Equal Protection Clause claims." In other words, when it comes time to consider whether the order amounted to a de facto Muslim ban, everything is on the table - Trump tweets, Rudy Giuliani diatribes and all. Now that the Ninth Circuit has rendered its decision, the ball is firmly in the Trump administration's court. They could appeal to the US Supreme Court, where the eight justices - four liberal, four conservative - can consider as much, or as little, of the ruling as they see fit. Mr Trump certainly seemed to hint that this was the next step, tweeting: "SEE YOU IN COURT, THE SECURITY OF OUR NATION IS AT STAKE!" shortly after the ruling. The administration could also decide to let the circuit court's decision stand and fight out the case in a full trial back in the Seattle district court. This would buy the president time to get his Supreme Court nominee, Neil Gorsuch, confirmed by the Republican-held Senate. Then, when the case eventually made its way to the high court, his chances of victory could be markedly improved. Whatever happens, it's clear that this case will be a political football. The fight will be personal, and it will be ugly. Reality check: Is Donald Trump's cabinet facing historic obstruction?